Mackay, a righteous man from Canada, sailed across the seas to the Orient and came to Taiwan. From a young man to an old man, he contributed thirty years of his life to Taiwan during which he proselytized and pullet teeth – all 21,000 of them. He passed away in Danshui in 1901, the first year of the 20th Century. People on the island of Taiwan commemorated him through hospitals, schools and literature. They forgot about art however. 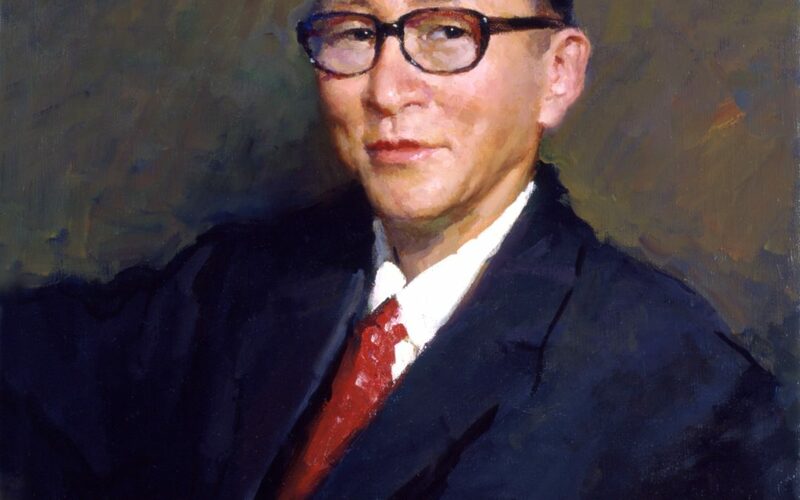 Taiwan needed a great painting named Mackay Practicing Medicine to remember this great man. Somehow, they forgot about this painting. “Forgot” is a kind way to put it when such a tremendous painting could not in fact be entrusted to ordinary painters. Eventually, the artist Yim Mau-Kun from China came to Taiwan and quietly took on the challenge of painting from people’s memories. The people on the island could present Mackay with their utmost respect at last; a fitting painting was finally made of a great man. Mackay Practicing Medicine was a success but its painter did not fare so well. Yim Mau-Kun’s talent was dogged by misfortune. His achievement was no match for his background so he was ostracized out of jealousy. An artist of his caliber deserved to be treated far better but he was marginalized while the painting Mackay Practicing Medicine was buried through neglect. Yim came to my house one day carrying his painting with sweat running from his brow. “I think I should give this to you, Master Li.” He said with a hint of sadness. 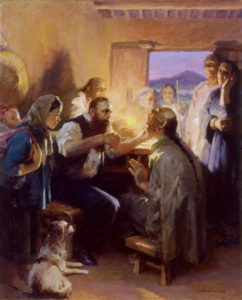 “After all, you truly understand this painting.” This was how Mackay Practicing Medicine ended up on the wall of my study where it would hang for many years. There it stayed until three years ago when I sold my study. Books were emptied from one thousand crates and this painting was stored away in the warehouse. I still thought frequently of this painting though. As someone who “really understands” the painting, I felt I should restore it to its rightful place. Kao Hsin-Chang was a man who sacrificed much for his beliefs. When he was hospitalized at the Koo Foundation Sun Yat-Sen Cancer Center in spring this year, what little money I could give would not have made much of a difference to his huge medical bill. By coincidence, President Huang Dafu at the Cancer Center had, at the suggestion of his wife, invited me to give a speech at the hospital on May 2. My mind leapt from Huang Dafu to Mackay and then to this painting gathering dust in the warehouse. When I took to the stage for the speech I brought the painting along as well. I then made the following proposal: President Huang Dafu should purchase the painting for six million Taiwan dollars (approximately USD$200,000). Half would go towards Kao’s medical expenses, one-third of the remaining half would go to the Huang Dafu Foundation while I would dispose of the other two-thirds as I see fit. I had after all donated far more than this amount during my three years in the Legislative Yuan. I decided on this arbitrary distribution because there was just so much need for charity that I always wished I could do more. For the next hour of my speech, President Huang sat in the first row in front of the stage and was obviously persuaded. He then gave a very moving concluding speech. In Lady Windermere’s Fan, the English writer Oscar Wilde took a dig at “cynics” by describing them as people who “know the price of everything and the value of nothing.” Though I joke about Rita being “Pro-Taiwanese Independence” and not quite a full-blown “cynic” yet, I was surprised when she failed to see the true “value” of the whole work. Since Rita had studied in England I assumed that she must have heard of this quote by Wilde before. On May 5, Rita Ho called me on Monday and said the president would like to purchase Mackay Practicing Medicine for two million dollars. Would I accept this offer? I told her that I never haggle so please thank the president for me. She then asked if I wanted to have the painting sent back to me. I said that I will send someone to bring it back. This brings another story to mind. During the “White Terror” period I was persecuted by the government. I lost my job, ended up in prison, and for fourteen years the name “Li Ao” was banned from all Taiwanese media and publications. The pressure gradually eased but the blacklisting continued. At the suggestion of his student Huang Hong-chen, Dr. Winston Chang, the President of Soochow University, invited Li Ao to teach at the university in order to emphasize their academic regard of Li Ao. When Chang became ill and ended up in a virtually vegetative state, I held a charity auction of my collection and donated seven million to him (six million for his wife and two children, and one million in his name to Soochow University). Someone asked me afterwards: Isn’t Winston Chang the illegitimate grandchild of Chiang Kai-Shek, your sworn enemy? Don’t you regret donating so much to him? I said that two thoughts crossed my mind one after another: “The first thought” was to donate seven million; “the second thought” was to donate less, say around “one-third.” So I was in two minds when faced with seven million dollars. One mind was very generous while the other mind was a bit of a miser. At this, I could only mock myself. I ended up hosting a press conference to publicly donate seven million dollars and tell the world how much Li Ao loved the grandson of Chiang Kai-Shek; at the same time, I launched the book Jiang Jieshi Ping Zhuan that I co-wrote with Professor Wang Zurong to tell everyone how much Li Ao hated Winston Chang’s grandfather. I thought of this story and also thought of President Huang Dafu. He probably ran into the same conundrum that I did when faced with six million dollars. Maybe he wasn’t in two minds but I am certain he had to choose between “reaction to value” and “reaction to price.” “Reaction to value” was “the first thought” and it is usually completely selfless; “reaction to value” was “the second thought” and all sorts of considerations start creeping in. Once “the second thought” emerges, we can come up with a hundred excuses. When that happens, we might believe in those excuses ourselves but we could’ve done more as well. Benjamin Franklin reminded people about “value of Money” in the Poor Richard’s Almanack. He seemed to have capitalized Money and linked it with value as a way of reminding us of how “price” in monetary terms has been elevated into actual “value.” In the preface that he wrote for Dr. Chen Yao-Chang’s book My Cell Career, President Huang Dafu praised Chen for “fulfilling his social responsibility as an intellectual”. On one occasion, I wanted to give NT$500,000 to every surviving comfort woman so I auctioned 100 off artworks to raise thirty million Taiwan dollars. Dr. Chen had “footed the bill” for one million Taiwan dollars by buying a work of calligraphy that Hu Shih wrote to Li Ao. According to supporters of “Price Theory”, Dr. Chen should have haggled. As a doctor who “fulfilled his social responsibility as an intellectual” however, Chen was naturally a believer of the “Value Theory.” He even hung up the Hu Shih’s calligraphy for everyone and Li Ao to see during the book launch for My Cell Career. I did not feel sad about the departure of this “item from my household” at all because even if I did give it away, I still managed to help two former comfort women by giving them NT$500,000 each. Why pass up on an opportunity to perform a good deed? Perhaps Hu Shih himself would have applauded the sacrifice of this souvenir from beyond the grave? I admire President Huang Dafu as a person. I knew what kind of person he was so I brought Mackay Practicing Medicine with me. He immediately asked Rita Ho to find six million Taiwan dollars and I admire this selfless aspect of his. The unfortunate thing about life is that you sometimes get a tug from your selfless aspect. At other times, whether by chance or by coincidence, when you are truly divided or when a thought first pops into your head, the light tug comes from your other aspect. The result of that tug is a sense of loss when you suddenly take stock. Who knows where Mackay Practicing Medicine will eventually end up?